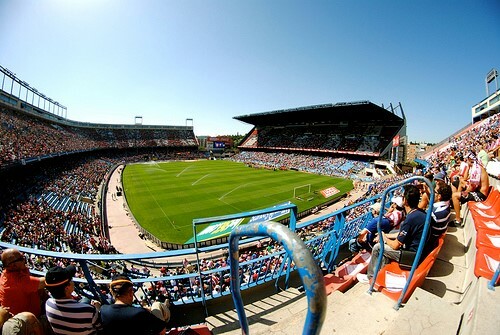 "Estadio Vicente Calderón - full stadium" (CC BY-SA 2.0) by BruceW. In a Premier League season where unlikely heroes Leicester City are proving hard work, dynamism and belief can eclipse even the largest of transfer budgets, in Spain, Atletico Madrid have been doing the same thing (albeit not to the same extent). Diego Simeone's men have yet again exceeded all expectations this year and, with just three games remaining of the domestic La Liga campaign, they are at the time of writing level on points with current Primera Liga leaders Barcelona. With a place in the semi-final of the Champions League to boot, Real Madrid's noisy neighbours could yet again make history this season after stopping a Barca/Real duopoly that has existed in Spain for far too long. Whilst Atletico are still 5/1 with http://extra.bet365.com/news/en/football/la-liga (as of 25th April) to take La Liga’s crown, how they compose themselves in the league's penultimate games will be crucial to where they end up come the end of the season. Can they hold their nerve? If their memorable title win of the 2013/2014 season is anything to go by then the answer is a resounding yes. In a two-way title race that went right down to the wire, Atletico needed just a point in their final game of the season to lift the Primera Division trophy. It sounded pretty simple on the face of it, until you realised that solitary point had to come against fellow title-chasers Barcelona at the Nou Camp. And after going 1-0 down early on in the aforementioned game thanks to a 33rd minute goal from Alexis Sanchez, many feared the worst for Simeone's battling side. However, following what can only be assumed was a rousing half-time team talk from their Argentine boss, Atleti pulled themselves level four minutes into the second period following a textbook corner routine which saw defender Diego Godin head the ball into the Barca net. From thereon in the home side ramped up the pressure in search of a winner but Atletico's resolute rearguard was able to hold on and win their first La Liga title in 18 years. ​How do their remaining games look? Simeone's side arguably have the most attractive-looking final three fixtures. Match-ups against Rayo Vallecano, Levante and Celta Vigo should all be relatively straight-forward for Atleti whilst their home-city rivals, Real, have a couple of potential banana skins to contend with in the form of Valencia and Real Sociedad. The league leaders, Barca, themselves may run into trouble on the final day of the season as they take on Europa League semi-finalists Sevilla at the Nou Camp. What's the verdict? Can do they do it? Of course, Barca are 1/3 in the odds to reclaim the Primera Division title for a reason but a slight wobble earlier in April will no doubt encourage the chasing pack of Real and Atletico. With Luis Enrique's men's resounding 8-0 win over Deportivo steering the Catalonians back in the right direction, Barca could just pip Atletico Madrid to La Liga’s crown on the season's final day.